Born into direst poverty in Liverpool, Linny escapes the life of prostitution her stepfather has forced her into, and flees to India, where the British Raj is in its infancy. There she will find heartache and suffering, but also an understanding of what love can mean and — perhaps most precious of all — freedom. But how did Linny achieve all this? And what has she sacrificed along the way? Most importantly, is this the end of Linny’s journey, or is her story not yet over? I first read this year’s ago, in fact it was book that cemented off my love for Historical Romance and it is a scorcher. It’s not your usual Romance especially with the lead character being a prostitute but because of what Linny has to go through while trying to survive day-to-day really make’s root for her the more. She a courageous young woman who; from no fault of her own has to do everything within her power just to stay alive even though that doe’s mean walking the lonely dark street’s of Liverpool. I have to admit that this is the only Linda Holeman novel I have read mainly because I haven’t been able to get my hand’s on any more. Yet! but she is a engaging, imaginative and highly entertaining writer and I really like her style, in this one in particular she stay’s away from the well trodden ground of Aristocratic Regency novel’s and instead take’s us along the darker and murkier street’s of the period and I do like that. We get to meet some very compelling character’s and not to mention the very sinister one’s which there are in abundance, but that is what make’s her work so highly enjoyable. I guarantee that anyone who like me has a love for Historical Romance then they will love this one, it is different but all the ingredient’s of a glorious romantic romp are there, Holeman take’s us along a journey that is filled with everything from romance to suspense and it is a wonderful ride. This is one of those rare book’s that you can read and re-read again and again and you’ll never get bored. I havn’t and i’ve read this more time’s then I can count. 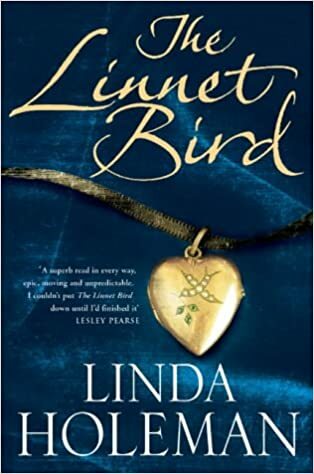 This entry was posted in Historical Romance, Reviews and tagged Historical Romance, Linda Holeman, The Linnet Bird.